I’ve been thinking about the cliché about how it’s the journey that’s important, not the destination. I completely believe this. And for me, the fact this is true brings much of my happiness and enjoyment of life. I’ve been trying to think of what in my life it has ever actually been about the destination, and I am drawing a blank. Even when I travel, it’s not so much about getting to a place as it is about what I do in that place once I’m there. In other words, it’s about the experience of the travel and the location and what I learn while there, not just the achievement of checking it off my list. 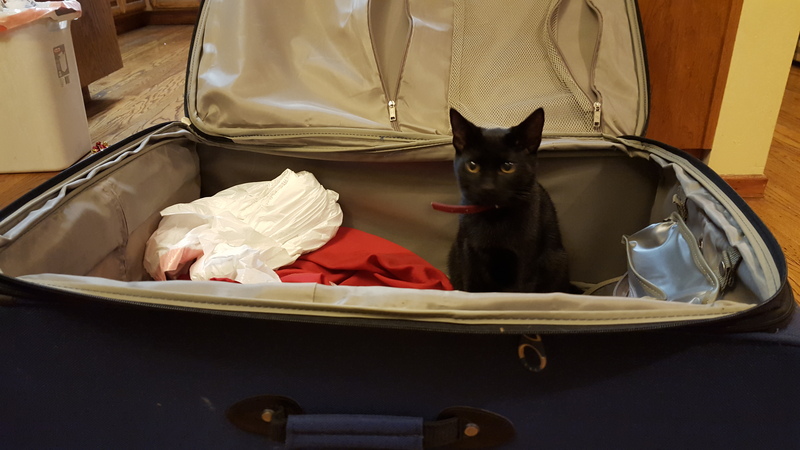 This kitten totally agrees with me and wants to take a journey himself. University? Of course getting the diploma has been helpful (although less so than I would have thought), but that’s not what I think of first when I think of my college years. I think of getting to immersively study music, I think of all the life skills I learned, I think about moving away from my family for the first time, I think of my friends and my professors and the university environment. Career and artistic aspirations? In a writing career, there are various milestones, and I take goal-setting seriously. But each of those milestones is only a blip on the radar, and then everything continues on, and I keep writing. Finish a draft? Great, keep writing. Sell a story? Great, now write another one. It is the enchantment I have with writing that keeps making it worthwhile. And that is all about the process. Romantic relationships? Well, now that I’ve achieved Girlfriend Status(™), I can cross this off my list of priorities. Haha. But again, this is mostly not about having a significant other or being married or whatever step you’re at. It’s about building something meaningful over time. There is no checking out just because you’ve reached a specific status. Friendships? Amazing pets? Etc? Same as above. It’s not that I don’t enjoy reaching a goal or celebrating a milestone. And sometimes, usually when it involves something really unpleasant, all I can really focus on is the end result as I push through the work to achieve it. But most of life isn’t spent celebrating milestones. Most of life isn’t checking off big accomplishments. Most of life is in the moments in between. So it behooves us to find a way to make those moments something precious. It’s no accident that Viktor Frankl’s three criteria for a meaningful life have little to do with materialistic metrics for success. Having work or a project that you find meaningful, having and maintaining personal connections with people and/or communities, and having a positive perspective on suffering and life in general: these three things are all focused on the moments between. They are ongoing. They revolve around fostering a general sense of purpose rather than centering on very specific goals. And, I think, they allow for greater resilience in the face of adversity. So yes, I care the most about the journey. I care about the hours I spend writing that rough draft, and I care about the time I spend with the people I love. I care about the two weeks I spent in Bali, not just my ability to say I’ve been there. I care about improving at things and learning new things. I care about the regular Thursday night dance and having ice cream and struggling to practice singing as much as I’d like. I care about taking a walk with Nala every day. And when I reach a destination, I try to stop and appreciate it, but ultimately it is never long before I’m thinking about my next steps. And I’m glad that’s true. To me, the next steps are happiness.